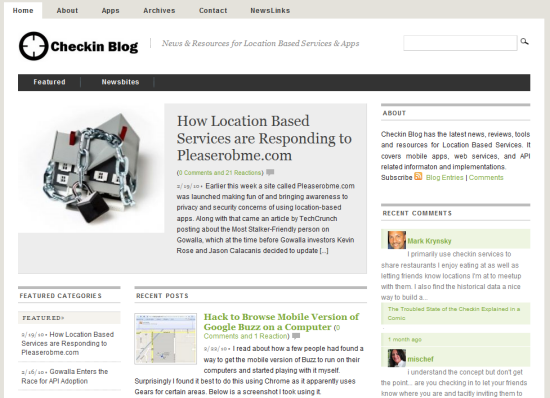 I created new blog in January to cover the world of Location Based Services at Checkinblog.com. I thought it was a great time to do it as the market for this niche is blowing up and there didn’t seem to be many other sites dedicated to its coverage. It was the perfect recipe for creating a new blog. I had my concerns before launching it that I might not have the time for it. I was already stretched thin between work and trying to maintain this personal blog and Lifestream Blog. But against my better judgement I launched it anyways. My hope was that I could just manage having guest bloggers write for it. I have recently come up with my own blogging formula for having 3 content types. Long form posts, newsbites which are links with quotes and short commentary, and then just snippets with links and an excerpt from relevant blog posts. My thought was to contribute the simpler stuff and write long form posts sparingly. Well the reality became evident quickly that (A) I didn’t have enough time to manage contributors which is a job itself and (B) personal contributions were taking away time from stuff I really wanted to cover on my other blogs. So with a dose of reality and some sadness I have to admit that I’ve failed. It really pains me to see it dying on the vine right now after launching with some decent fanfare and linkage. I still have a strong interest in the checkin space but I’m really trying to limit my focus on how it relates to Lifestreaming. So with this news I’ve decided to try and find a worthy successor to take over the site. If you, or someone you know is a good blogger, who’s dedicated and interested in covering the checkin / location based services space then I’m interested in learning more about you/them to take over the site and manage it. I’d love to offer this great opportunity for someone to have a head start building a blog and audience around such a hot niche. If you have any questions you can leave a comment or contact me with details about why you feel you’re the right person to take it over.